Answer: Interesting question. You never responded to my request for your geographic location, and location affects your ability to see the phenomenon described, but I can still provide an answer. First a disclaimer: The video linked above contains a lot of incorrect science. But I’ll ignore that and focus on the claim that it’s possible to see both the Sun and Moon above the horizon during a lunar eclipse. For some background on lunar eclipses, you might want to first read my Feb 6, 2017 post. At first glance the claim seems impossible. 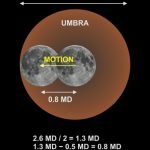 Since the Sun-Earth-Moon must be collinear during a lunar eclipse, the Sun and Moon can’t both be “up” at the same time. As a general rule: When the Sun sets, the Full Moon (if that’s the current phase) rises, and when the Sun rises, the Full Moon sets. Of course, that’s for an observer on the Earth’s surface … not for an astronaut in orbit. The graphic at top shows a lunar eclipse as seen from above the North Pole. From this perspective Earth rotates in a counter-clockwise direction. 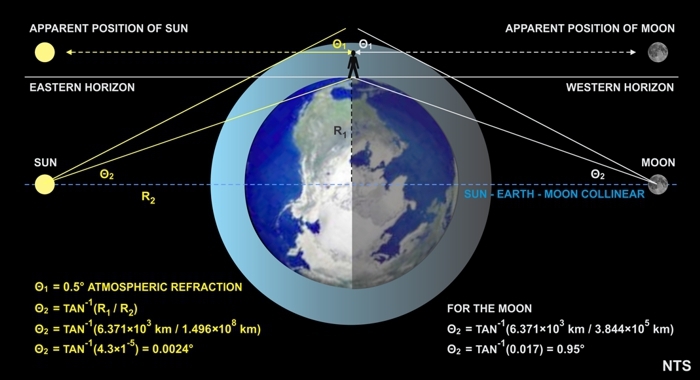 When the Sun–Earth–Moon are perfectly collinear, simple trigonometry shows that, for an observer on Earth’s surface, the center of the Sun would be 0.0024° below the horizon. But the Sun’s diameter is 0.5°, so you would see (most of) its top half above the horizon. The center of the Moon, however, would be 0.95° below the horizon, which would put its top edge 0.45° below the horizon at collinearity. You might see some “moonglow” but the Moon itself would be set. So based solely on that geometry, a “daytime lunar eclipse” appears to be impossible. But perfect collinearity is not required for a lunar eclipse. Click on the thumbnail below to see how long totality can last. That 1.7 hour duration extends the eclipse 0.85 hours to either side of perfect collinearity. 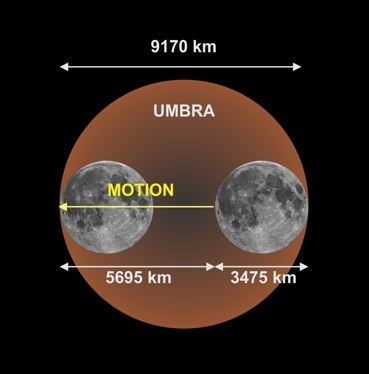 So if the Moon is right at the eastern edge of the umbra, and totality is about to end, the center of the Moon would be another 0.8 MD to the east of the umbra’s center (see thumbnail below). It would now be just 0.55° below the horizon, instead of the 0.95° calculated at perfect collinearity. And here’s where the effect of atmospheric refraction comes into play. A celestial object on the horizon will appear 0.5° to 0.6° above the horizon due to the bending of light as it enters our atmosphere. Since both the Sun and Moon have an angular diameter of 0.5°, they can appear above the horizon when in reality they are below. For a more in-depth explanation of atmospheric refraction, go here. 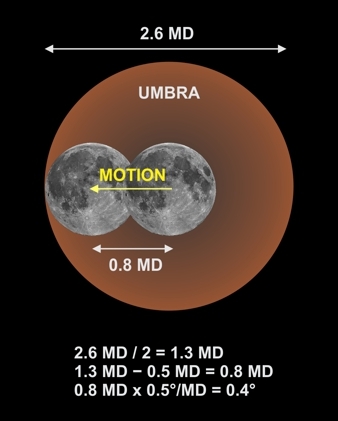 So between the diameter of the umbra (which can vary based on Earth’s orbit) and the size and speed of the Moon relative to the umbra (which can also vary) and the effect of atmospheric refraction (which varies from 0.5° – 0.6°), the answer to your question is: Yes. Using average values for all relevant parameters, the configuration described in my analysis would result in the Sun being about halfway up at sunrise, and the eclipsed Moon about halfway set on the opposite side of the sky. But both would be visible. Yet even that would require a clear view of both the east and west horizon, like you’d get from an island or coastal peninsula or summit of a tall mountain or maybe the open Great Plains. That’s why I asked about your location. This rare phenomenon wouldn’t last for long, as both Sun and Moon appear to move through the sky at a speed of 0.25°/minute due to Earth’s rotation. So the “window” for seeing them both “up” would last less than a minute. One of them would set while the other continues rising. But using optimal rather than average values could increase the degree and time of mutual visibility. Bottom line is that the vast majority of lunar eclipses come nowhere near this ideal configuration, so “daytime lunar eclipses” are indeed rare, as the cited video’s author claims.